Join us as we journey along in training up our children (and ourselves!) to live fully, love deeply and learn passionately, with faith that promises (and delivers!) truly happy hearts. 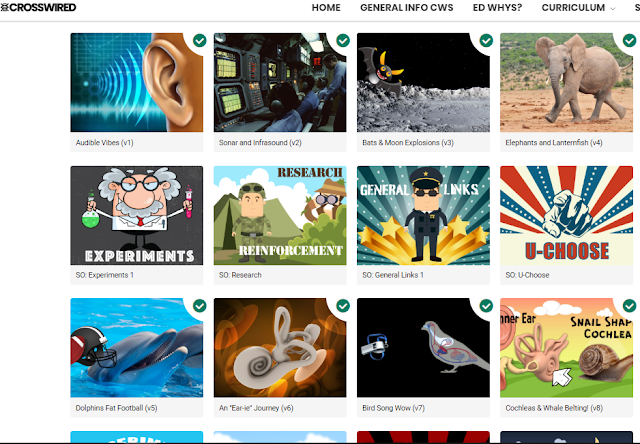 If you are looking for an engaging, original resource for online science learning that encourages offline learning and can easily adapt to almost any style of homeschooling, CrossWired Science is worth looking at. CrossWired Science intergrates multiple fields of science - and other things - to help learners make connections while also glorifying God. 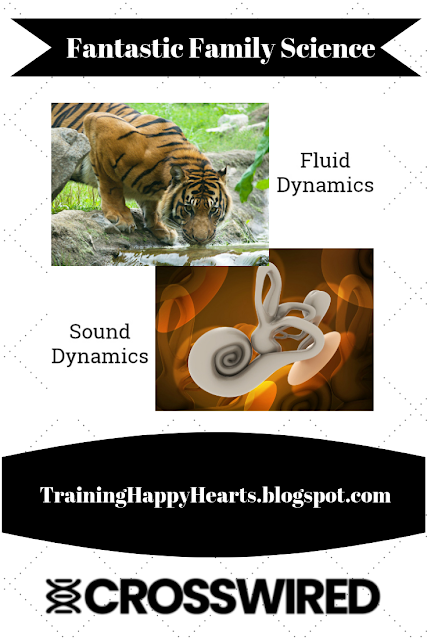 It comes as a yearly digital subscription and has two Global Topics available at this time - Sound and Fluid Dynamics - with more content being added soon. The program is self-paced and geared for students from ages 4-18 with elements that will appeal to and challenge every age, so families can all be on the "same science page." Despite the wide age range, Science terminology used in the program is NOT watered down. Concepts are simply taught with plenty of interesting similes, connections, etc. to keep everyone engaged! Due to the unique approach of CrossWired Science, I was excited to excited to be part of the review team that tested a beta version of the program. Initially, my intent was to have each of my children use CrossWired Science individually and to, sometimes, use it together as a family, but, unfortunately, our two computers died just as we began our review, so we ended up opting to use just one log in and to do CrossWired Science for now with the hand-me-down computer a friend generously gave us. That worked well, and, as you will see in just as a second, some of my children are looking forward to having their own logins, soon. CrossWired Science is a science curriculum with lots of cool videos, experiments, and other things that you can use to learn about sound and fluid at the moment - with more to come. Dolphins can jump really, really high. You hear by tiny hairs waving around in your ear behind your eyes. As you can see, I learned different things. CrossWired Science is not all just about one thing it is meant to be teaching, but puts many things together. I would like to keep using it with my own account, not with my Mom, so I could watch and explore by myself. I would recommend CrossWired Science who like science and want a non-traditional way to learn it. I just love that my son appreciates the inter-connected ideas that CrossWired Science presents. It's actually one of the reasons I like the program, too: it recognizes that we learn best when we are able to make connections rather than studying things in isolation and truly brings a wide array of knowledge together under a single Global Topic. In fact, the eight fun, information-packed videos under Sound explore: What Sound Is, Sound Transfer through Solids, Liquids & Gases, Ultrasound, Infrasound, Decibels, Microphones, Vocal Cords, Voice Making, Larynx, Baby Cries, How Ears Work, Cochleas, Sonograms, Speakers, Hearing and Sound Making in Various Animals and Insects, Lion Roars, Alligator Infrasound, the History of Sonar, Dolphin Sonar, Bat Sonar, Orienting by (non-sonar) Sound, Syrinx, Bird Songs and Calls, Whale Songs, Elephant Infrasound, Ultrasound Devices, Ceramic Piezoelectric Crystals, Piezoelectric Speakers, Sonar, Laser Sound Transmission, Musical Instruments and more. Of course, some of these are just brushed upon, but all are tied together well, and between explanations and animations so much can be learned and retained! Plus, other parts of the subscription site offer places to dig deeper. How cool is it that CrossWired Science ignites interest across such a broad spectrum of facts and subjects! 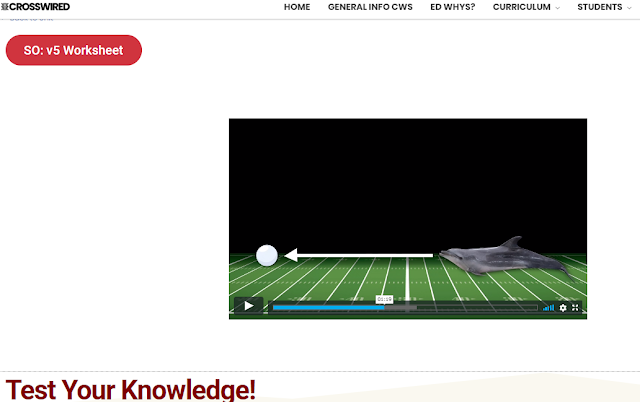 CrossWired Science is an online curriculum. You can learn about two things right now: fluids or sound. We chose to learn about sound first. After you click on the sound icon, there are lots of little videos that you can watch and there are experiments and other things. What we did was watch the videos first. After you watch the videos, there is a test underneath it to see how much you actually retained from the videos. Did you know that whales can communicate from America to England? That's a loooong way! Did you also know that there can be hundreds of bats in a cave, but they will not crash into each other because they each have their own wavelength of sonar? 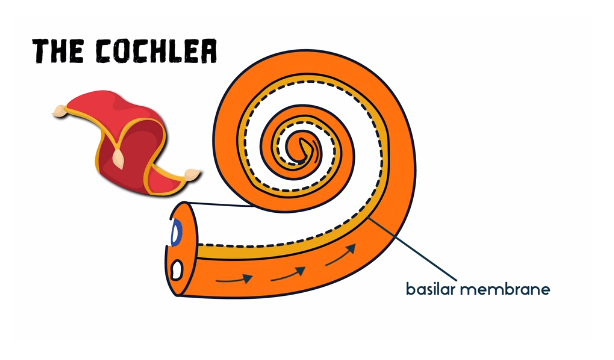 Also, did you know the way we hear things is because there are tons of hairs in our ears and each of those hairs has microscopic hairs on top of it. Some open and close. That's how we hear things. I found CrossWired Science a fun and enjoyable science curriculum so far. I want to continue it and recommend it to parents like my mom who have high stress levels because the curriculum is low-stress for parents. And, yes, it made me laugh when she recommended the program to parents like me who "have high stress levels" because it is such a low-stress program. I try not to live in a highly stressed state, nor to allow my children to sense when I am under stress, but, sometimes live just piles things on - healing from a surgery, computers dying, a hard drive with all files being lost, taxes being due... You know, life stuff! As humans, we have to deal with a lot of it - sometimes all at once. As homeschoolers, we have the extra challenge of still attending to our children's education and formation in faith. So, having resources to make doing that easy is key! CrossWired Science makes family Science learning so easy! Just open the website, point the mouse, click, then enjoy the videos. Take a quiz. Chat. 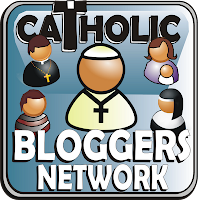 Browse other sections of the site for ideas for experiments, games, devotionals, field trip ideas, etc. if you like... Varied, interesting, and easy, igniting curiosity and teaching new concepts! That's my kind of Science program. 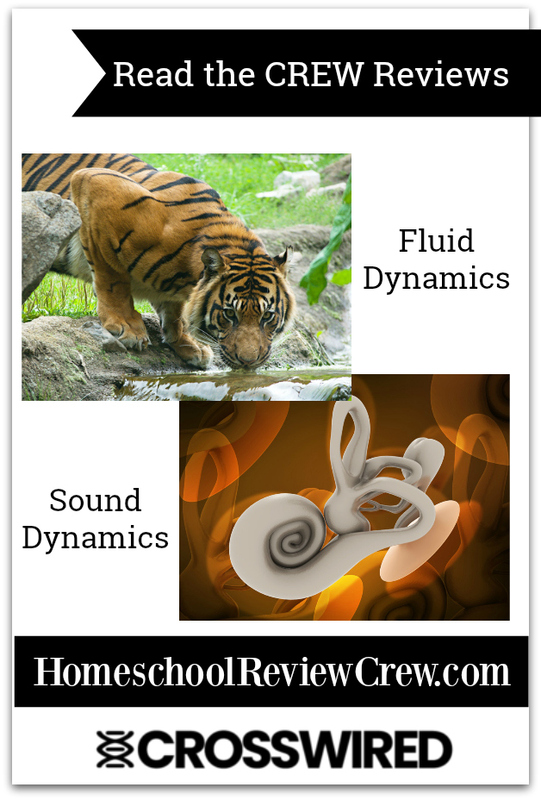 CrossWired Science is a science program that teaches two types of science so far - fluid and hearing. We decided to do hearing after watching the first video (of both fluid and hearing). I kind of wanted to choose fluid, so I will probably to that later. We watched the videos together and I liked them. They were not too long, but not too short. The hosts related sound to a lot of things like a football field, a gun shot, and airplanes. They connected stuff they were teaching about to animals and more. It made it interesting. I would like to use this for science more. I recommend it to others, because it is not boring and you can learn a lot. I agree with my youngest. Even at is nascent stage, CrossWired Science already had so much information and appeal. We have been enjoying it as a fresh, fun approach to family Science learning with a Christian worldview. When using CrossWired Science, there are two options to choose when studying each Global Topic: one meant for "first timers" and one for "second timers". That way, families that have studied a topic can cycle back around to it a second time, reviewing material while also discovering new information. Within each Global Topic are eight core videos, which vary in length, but are definitely short enough for a "Morning Time" or "Afternoon Basket" family study time as we used them. Following each video, there is a short online multiple-choice quiz that gets automatically graded. You can also find printable worksheets with questions that test knowledge with more than multiple-choice and have keys in the teacher's section of the program. After the first four jam-packed core videos, there are buttons that can be clicked on which take you to suggestions and directions for other learning and experiences, then, there are four more videos, before more other learning buttons. Experiments: Directions for a variety of experiments are presented. Some require only household supplies while others require purchased items. All experiments are optional, but, of course, doing some is worthwhile. General Links: These are typically embedded YouTube videos related in some way to topics in the Core Videos. There is enough information here to view over a full week, I'd say, if you decide to view everything. Unit Links: These are divided into three different levels and provide bunny trails that are loosely connected to main material. U-Choose: These are suggestions for hands-on projects and activities. Field Trips: These are suggested field trips to help reinforce or learn more about the topic. Some are no-brainers (museums and outdoor excursions) and some are only for those with high budgets (like cruises! ), but others are what I'd consider helpful ideas. Reinforcement: There are suggestions for a wide age range to reinforce ideas. Research: The company sees that there is "an unprecedented amount of information being added to the 'the world’s data base' every year" and wishes to encourage students to "glean the precious from the worthless" as a needed skill. Gold Digs: Oodles of small pieces are offered here to help students forge connections between main concepts and other interesting ideas that go in all sorts of directions. Short assessments follow each, with differences in difficulty for first and second time user paths. There are also printable worksheets. Digging Deeper: This is like the previous section, but with topics more directly related to the main concepts of the unit. Devotions: These are short essays that relate in some way to the main concepts. All of these things, though ordered on the screen, can be clicked in and out of at any point, so homeschoolers that like structure, can use the on-screen order and a suggested course of study calendar found elsewhere on the program site, and, those who lean towards the delight-directed, can browse and go as desired. CrossWired Science is truly flexible enough to meet both types of homeschool styles - structured and freewheeling. No matter what style you use for homeschooling, CrossWired Science will teach real science while also showing the glory of God through what He has made and through come content that is explicitly designed as devotional(mostly in the Digging Deeper and Gold Dig sections). This "God-connection" allows you to use the program as a stand-alone curriculum that glorifies God or as a supplement to any other Science curriculum that may be lacking in a "God-element". It can also work as a full, stand alone curriculum for three months of science with its current content, and, then, with several more additions coming soon, as a full year of Science content. Finally, when all planned content has been added to the program, CrossWired Science will offer six years worth of Science content. Who Can Benefit from CrossWired Science? Obviously, our family has been enjoying being on the ground floor as CrossWired Science is being built. It's been fun for us to dive into the first Global Topic and to check back with the site often to see what new content has been added. (More is being added all the time!) Thus, we would recommend CrossWired Science to other Christian families that would like an eclectic, fun, and easy way to learn about science that truly connects multiple fields and is growing in content every week. one easy, inexpensive place to find online science learning geared toward multiple age levels. enrichment materials and activities to dig into at your own pace. progress that parents can note, including graded quizzes. a wide array of experiments. content that allows for creativity in approach and use. adaptability for your unique homeschool style and schedule. enjoy fascinating information, activities, experiments, and more. CrossWired Science, even at the beginning stages it is at with only two main content areas so far - Sound and Fluid Dynamics - does a commendable job at balancing the digital world with the world outside. It uses technology to teach concepts and pique student interest, then, it encourages students to go out and actually experience and learn more in the real world - and it does all this in a family-friendly, God-glorifying, cross-age way at an economical price: Now under $30 annually, plus $10 for each additional student subscription, when you use this affiliate discount link. You can currently gain access to a FREE sample lesson of CrossWired Science. Or, like I said before, you can purchase this online Science program - with its dozens of videos, dozens of links, and growing array of fascinating, fun lessons that glorify God - for just under $30 a year. 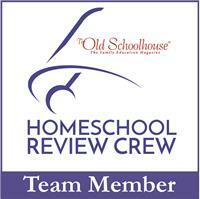 Eighty Homeschool Review Crew families have been tailoring CrossWired Science to their current homeschool needs. Discover how each has been using this homeschool science program. 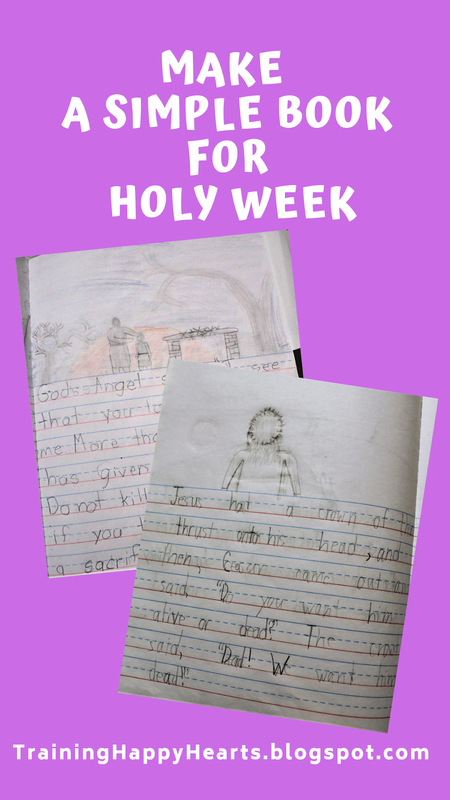 Some years ago, when all my children were young, we enjoyed a hands-on Holy Week during which we did a different art project each day in conjunction with the readings. This year, we'll be continuing a writing and illustrating project that we began at the beginning of Lent - one that you could easily adapt into a Holy Week book in your home. At the beginning of Lent, I was looking for a way to get my children and I back into regular Together Time studies including Bible reading. I also wanted to highlight narration, writing, and handwriting skills. Thus, when I spied three copies of Upon a Tree, a 2016 devotional booklet from Creative Communications, in my Lenten files, I decided that we would use the booklets for a simple Lenten project: Each of my children would write and illustrate their own book, retelling parts of Salvation History. To do so, I placed three primary composition books (somewhat like these ones) and the devotional booklets near our kitchen table. Then, daily, we took these out, along with our New Saint Joseph, Family Edition of the Holy Bible, pencils, and colored pencils, and I read the Bible verses noted in the devotional. On some days, we chatted about what the Bible verses said, how they related to Salvation History, and what their application to our lives might be, while, on other days, we simply read the little poems in the devotional that went along with the Bible verses and then carried onto the next step. That step was to have children either write and illustrate a narration about the verses which we had read aloud or to compose a poem or story segment related to them. Then, I would help them correct their spelling, punctuation, etc. and comment on their handwriting efforts. Some days this worked beautifully for all of us. Other days, one child or another wasn't into it and rushed their work. While, admittedly, on still other days, we neglected to get to our simple project and, then, played catch up later on. Regardless, here we are, headed into Holy Week, ready to write the final portions of the story of the Passion before adding a page for the Resurrection on Easter Monday. And I am pleased. For, although my children and I did not manage to make Bible reading a daily Together Time habit this Lent, we got closer to making it one and each of my children wrote their own simple Salvation History story. I know what we have been doing is not rocket science - just reading the Bible, chatting, narrating/writing, and illustrating - but it is worthwhile, and because we are doing it in bound notebooks, it will become a keepsake for the kids that they can reread in future years. You could do a similar thing this Holy Week, using an inexpensive primary composition journal, printing out free story writing paper, or using a blank book; then, reading the daily readings, and having your children write and illustrate. Alternately, read a page or two of a favorite Lent/Easter picture book, such as The Easter Story, A Child's Easter, He Is Alive, Love One Another, or He Is Risen: The Easter Story each day, look up the Bible verses that would correspond to what you read, read those, then write and draw away. In the end, you should have a lovely, child-written-and-illustrated book to read for years to come. May you have a blessed and beautiful Holy Week! Whether you're just beginning to homeschool high school or you're scrambling to get necessary record keeping together as your child's homeschool journey nears its end, Transcripts Made Easy: The Homeschooler's Guide to High-School Paperwork by Everyday Education can be a valuable resource. Now in its fourth edition, this classic resource has been used all over the world to simplify the process of planning and record keeping as you homeschool high school. The book comes in a print edition or as an e-book and was originally written by Janice Campbell after she had created a transcript for her oldest son as a way to help others avoid the trial and error she had been through. Janice has since created successful transcripts for other homeschooled high schoolers, extensively researched the college admissions process, delineated post-high school options for those who are not college bound, and teamed up with experts to co-author portions of her newest edition of Transcripts Made Easy: The Homeschooler's Guide to High-School Paperwork. As a result, the fourth edition of Transcripts Made Easy: The Homeschooler's Guide to High-School Paperwork is tried-and-true, partly new, and carefully put together to offer you clear, practical ideas and tools for streamlining paperwork and navigating your high schooler toward a successful future..
My oldest is but 13 years old. Yet, he is already thinking about his future. At present, he wants to increase his skills and knowledge enough to begin - and finish - high school early, not so that he can go to college, but so that he can expedite the beginning of his adult life. Frequently, he voices a desire to be more in charge of his day-to-day life and to be able to do work which will allow him to pursue passions while providing for himself. Behind my eldest come two other children. One has some yet-to-be-formally-diagnosed learning blocks and is currently undecided about the future. Another is interested in college for one reason only at this moment: he dreams of joining a football team, and, then, playing both in college and professionally. Three different children. Three different sets of needs. Three different learning styles. Three different ideas about the future. But just one set of parents who wish to guide them through their education in a way that will best prepare them for whatever their adult lives may hold. Indeed, whether my children's current dreams come true or whether new promptings in their hearts lead to new goals in their minds, my aim is to help them be as prepared as they can be. This is not an easy task some days, and it can become a concerning one when I stop to think, How can I best do this? What do I need to consider to ensure that my children are doing whatever we need to do now in a way that will allow them to obtain the right "tickets" to their futures? That is where Transcripts Made Easy: The Homeschooler's Guide to High-School Paperwork comes in! In the past, I had heard wonderful things about this book, so when given an opportunity to review a pdf e-copy of it, I jumped at the chance. I thought the resource might help equip me to better navigate the official ins and outs of homeschooling high school and guide me in a streamlined approach to effective documentation so whatever end my children have in mind, I can support them and ensure they are ready for their next steps. I was not disappointed. I have read Transcripts Made Easy: The Homeschooler's Guide to High-School Paperwork from e-cover to e-cover and found it to be a fantastic resource - chock-full of ideas to inspire, tips to think about, clear steps to take, and tools with which to get down to business. 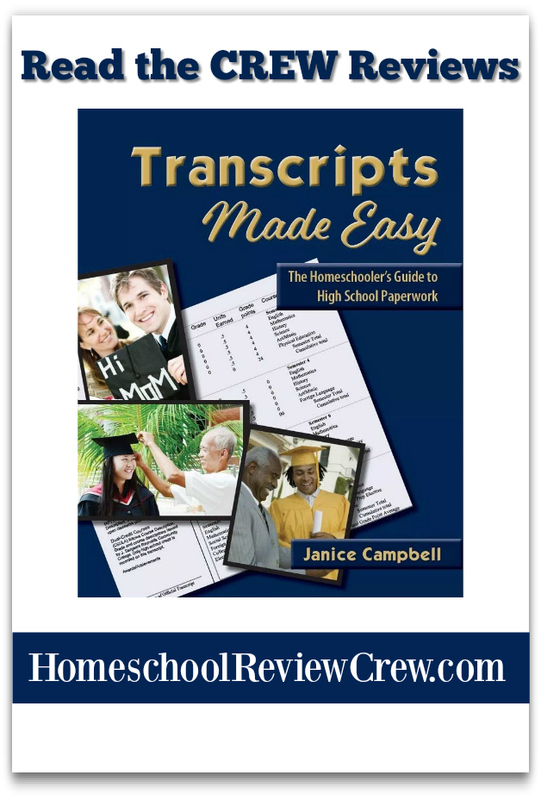 In Transcripts Made Easy: The Homeschooler's Guide to High-School Paperwork, author Janice Campbell offers plenty of information and guidance for those, like me, who are just getting ready to enter into homeschooling high school and also cuts right to the chase for parents at the end of their homeschooling journeys who may be scrambling to pull together a transcript as soon as possible. which approaches you can take to planning and scheduling high school learning. what your student needs to study in high school whether college-bound or otherwise. when to take specific steps and tests, such as PSATs, SATs, ACTs, and more, if your child is college bound. what alternatives to consider with your non-college-bound child. how to successfully keep records for launching your college or non-college bound child into a successful future. what college freshman need to know. keep simple, accurate records using included reproducible record keeping sheets. follow step-by-step instructions if you wish to create your own effectively designed records. select a transcript format that best highlights your student's achievements. create a credible, professional transcript using software that you already own or can acquire for free online. issue fair grades for transcripts regardless of your homeschool style and if you regularly utilize quizzes, tests, and grades. grant credits for traditional classes, unit studies, work experience, and other activities whether you are a "boxed curriculum" sort of homeschooler, an unschooler, or somewhere in between. award extra credit for exams, honors classes, and dual-credit classes should your child wish to pursue such options. calculate a grade point average with or without weighted grades. tailor records and transcripts for special needs students. is a treasure trove of wisdom, practical guidance, and fill-in forms that you as a homeschool parent - and even your homeschooled highschoolers themselves - can benefit from when approaching planning and documentation. I am delighted to have this resource at my fingertips and having read through it once myself, am now planning to use it in partnership with my oldest son as a resource for planning his high school career and beyond. I have also found myself recommending the book to others. In fact, one day, a friend asked me a question, and, the very next day, I saw a clear answer to it in Transcripts Made Easy: The Homeschooler's Guide to High-School Paperwork. So before I had even finished the book, I found myself pulling it up on my computer to show a page or two of it to my friend, who appreciated how clear the book is and how easy it makes finding answers. Since then, I have also recommended Transcripts Made Easy: The Homeschooler's Guide to High-School Paperwork to others in my homeschool circle. Just this morning, I was talking to friends about how the book is a perfect blend of practical helps - such as sample forms, printable record keeping documents, and step-by-step instructions for creating your own documentation - and been-in-the-trenches counsel. I was raving about how the book is not too long, is well laid out, clearly conveys important information, and, - my favorite part - speaks to all homeschoolers. Whether you are an unschooler, a relaxed homeschooler, an eclectic one, one who uses an all-in-one, boxed curriculum, a homeschooler with a special needs child, one with a college-bound child, or one with a child who has alternate post-high school plans, Transcripts Made Easy: The Homeschooler's Guide to High-School Paperwork speaks directly about why a transcript is important, how to make one, and, more importantly, what's behind the transcript: the unique education of your child. Undoubtedly, no two homeschool families are exactly alike. In fact, if my family is anything to go by, no two homeschoolers - even in the same family - are alike. Each family - and each child within a family - has a unique blend of setbacks, skills and styles, not to mention individual passions and plans for the future. Thus, it is important that a book on homeschool transcripts, planning, and record keeping recognize this fact and offer information that breaks out of the typical high school box and includes relevance for both college bound students and those that seek other pathways to living out their life's calling. 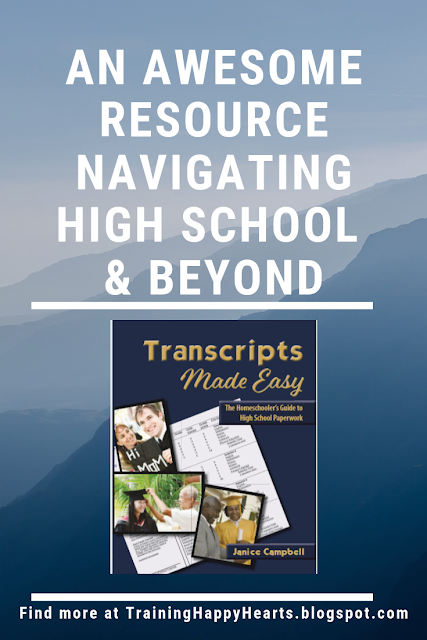 Transcripts Made Easy: The Homeschooler's Guide to High-School Paperwork does just that. The resource also offers many thought-gems that had my head nodding in agreement, my e-highlighter going, and my mind firing with connections. In order to glean all the wisdom contained in the book, of course, you'll need to get a copy yourself. In order to use the nuts-and-bolts, easy-to-follow record keeping and transcript forms and samples in it, you will, too. "The supreme end of education is expert discernment in all things— the power to tell the good from the bad, the genuine from the counterfeit, and to prefer the good and the genuine to the bad and the counterfeit." This well-chosen quote drew me in right away as it wonderfully aligns with my own thoughts and let me know Janice and I have similar aims in mind. Janice drew me in further by acknowledging, up front, that there are many types of homeschoolers and that her book was created to help us all - even eclectic, sometimes relaxed, sometimes unschooly ones like me. Even if you are a relaxed homeschooler or an unschooler, your teen will eventually need a transcript. Since I am sure you would rather spend your time on people, rather than paperwork, I created Transcripts Made Easy to make planning, record-keeping, and transcript-making easy. That's my kind of mission! Then, Janice went on to keep making me nod my head and smile - and, later in the book, offered very practical tools for everything she talked about - reproducible record keeping sheets, handy charts, on-point lists of links and resources for more information, etc. A student who is old enough to do high school work is old enough to plan time wisely. One basic academic planning skill is learning to look at project due dates and create intermediate deadlines for each step. My son struggles with executive planning skills and, sometimes, his desire to do something and his time management skills do not match up. Thus, given that he wants to begin high school early, I plan to use this thought-nugget as something we can chew on to see how he plans to improve his time management skills and how I might support him. I want to give him an opportunity to prove his capabilities, exercise his strengths, and unwrap his future while also being cognoscente of of his unique brain wiring, his preferences, and the styles and needs of the rest of our family as we plan and schedule high school. Fortunately, you can choose the type of scheduling that best fits your student and your lifestyle. The four years of school and six subjects per year, one hour per day schedule is easy to use, but there are other options that can help you teach some subjects more effectively. In fact, by the last couple years of school, it can be a good idea to present lessons one week at a time, allowing students to decide when and where to do the work. It is excellent preparation for managing time in college! A similar option is what a nearby military academy calls the “One Subject Plan.” The school year is divided into five seven-week terms, and during each term the students study only language arts and math plus one other subject. This intensely focused immersion style of learning is what our family used for independent or deadline-focused learning. It is especially useful if you are preparing for a major trip and want to do an in-depth study of the history, culture, and language of your destination. I have also used it for academic, business, and home-centered subjects, and the boys have used it to learn about subjects ranging from World War II to classical music, computer programming, HVAC, and novel-writing. When we were doing school with the boys, we followed Charlotte Mason’s advice and did short, focused lessons that gradually increased in length as they grew older. By high school, we found that daily short lessons were still most effective for problem-based subjects such as math, but a college- or block-style schedule was often more interesting and effective for classes in the humanities and sciences. For much of high school, we did math daily and focused on the humanities on Monday and Wednesday; the sciences, including labs, on Tuesday and Thursday. This balance seemed to work effectively for all of us, and was a good preparation for the longer classes they encountered in college. Thus, as you can see, before I was even very far into Transcripts Made Easy: The Homeschooler's Guide to High-School Paperwork, I was finding wisdom and inspiration which affirmed my developing inclination to partner with my oldest child to plan his high school with a mind for his unique personality and future. Consider (different options), talk them over with your child, and share them with other family members or friends who have a college background. See what kind of a response you get. Along those lines, encourage your child to solicit as many stories about “mistakes” in college as people are willing to share, because, despite how it seems, children do take in what they are told. And remember, Mom and Dad’s voices may not be at hand every day to guide and guard, as they so long were. But the years of nurturing and training, plus the collective wisdom of those who have trodden this path before them, can resonate in students’ ears. And every time it does, there is a good chance an avoidable mistake will be avoided. Students who follow a traditional curriculum do not usually have much trouble naming classes. However, if you have put together your own curriculum, or if you are a relaxed homeschooler or an unschooler, one challenge you will face is translating unconventional learning experiences into descriptive class names. Once you get going, however, you will find that it is easy, and can even be fun. Along with this idea were examples of course names and descriptions and a suggested further resource I had never heard of nor considered before and am now excited about. If you have students who maintain they do not need college, do not want it, or do not understand the purpose and meaning of education, it is probably not the right time for that student to go to college. It is better to wait until they are ready than to rush off right after high school and incur debt for an education they will not appreciate. They can go to work, start a business, work on the family farm, or do something else. If they eventually need college, it will be there. My husband and I encouraged our sons to cultivate both a white-collar head skill and a blue-collar hand skill, not just to have backup career options, but for wholeness of spirit. Although each has a bent toward one type of skill or another, having experience in both has been a personal and professional plus for each of them. I love this idea and am now more focused on doing the same with my own children. You can also record activities such as hobbies, sports, or vocational training, as well as academic events (science fairs, debate club, and so forth), for nearly everything is worth at least some credit. Remember that public schools give credit for choir, journalism, band, independent living (formerly home economics), typing, and other classes that are not strictly academic in nature. Learning is learning, and it is all valuable. She, then, went on with examples and how-to's for doing this. Although home educators are a diverse group, the actions of each of us affect the reputation of homeschoolers everywhere. Each time a college admissions counselor encounters a homeschooled student whose performance meets or exceeds the expectations created by the grades on his or her transcript, that counselor is likely to gain a more positive impression of homeschoolers. However if a student presents a straight-A transcript but has abysmal test scores and struggles in the classroom, the impression is much different. I whole-heartedly agree with his. For, even though I am not big on grades, it frustrates me when I see some homeschool friends "graduating" students who are not prepared for life after high school or inflating grades. Doing so, I believe, just doesn't serve the graduates and also can hurt other homeschoolers. I agree that as individual as we homeschooling families can be, what one of us does certainly affects how others of us are viewed, and, therefore, when assigning grades, we need to do so with credibility, and I love how the book does not shy away from this truth. Keep in mind that most require appropriate documentation that has been done within three years of admission or testing. Counselors want to ensure the student did not suddenly develop a special need to give him or her a better chance for success in college admissions! As I have said, I have children with special needs. However, I have done any formal testing with one of them and have not had testing on another since he was a young child. Reading this, then, made me realize that I need to open a conversation with my husband and children about possible testing as we prepare them for their futures. Is There Anything that Would Make This Resource Better? Honestly, I think Janice and her expert co-authors have put together a wonderfully helpful book that is as practical as it is insightful, so there is very little I would suggest for future editions save one thing: a way to enter data into the printable record keeping forms, so that those who do not wish to handwrite on them nor to follow the clear, step-by-step instructions for creating their own documents, can just type, print, and go. With the way it seems Janice truly takes reader feedback into consideration when putting out new editions of her book, I would guess the next edition will have this feature. I knew I would like Transcripts Made Easy: The Homeschooler's Guide to High-School, but had no idea how much I would. For, while I read it more for general knowledge as I kick off the high school years with my eldest and field questions from friends in the homeschool groups I admin and lead, I discovered both appreciated inspiration and specific information that I can use right now and continue to use right up through when each of my children graduates.Transcripts Made Easy: The Homeschooler's Guide to High-School takes what could be a boring and even intimidating topic - transcripts - and walks you through each step clearly and concisely while also offering ideas that can help you shape your child's entire high school career and beyond. I cannot say enough about how well written this resource is and recommend it here online just as I have been doing every day while reading it to in-person friends. Check out what other homeschool parents with kids at different age levels thought about this resource. 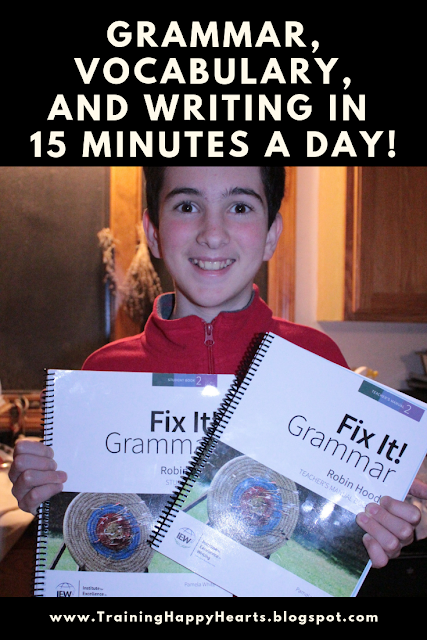 What kind of program can get a non-workbook kid happily focusing on grammar, vocabulary, and writing in an effective and engaging student book format more days than not each week? Without question, since my son has began reviewing Fix It! Grammar Robin Hood Student Book 2 we've found it to be an easy-button for English Language Arts that pleases us both. I appreciate that the program is off-screen, open-and-go, and truly easy and effective to use, while my son likes that it he can take 15 minutes or less a day to build his skills while also enjoying a story. Indeed, Fix It! Grammar has proven itself to be a happy surprise in our home - drawing my son in and helping him review and build skills, little by little, in an applied grammar, spiral approach that transfers well to personal writing and editing endeavors. Moreover, I am delighted with how easy the corresponding Teacher's Manual is. To guide my son and help him to correct his work, I do not have to do any more prep than to open the spiral bound manual to the page that matches the work he has been doing in his Student Book, then read, check, and chat. It's really that simple to use! 33 weeks of lesson keys, grammar lover notes, teaching tips, etc. Bound with it is a 45 page grammar glossary and codes for accessing a free downloadable student e-book for family use and two e-adios on grammar. Everything is right there to support you as you as guide your child in success! When Mom first gave me the book, I was happy because it is about Robin Hood. I like fantasy and stories about archers, so even though Robin Hood is not exactly fantasy, the content is enjoyable for me. I also appreciated the fact that you are editing a story and not writing boring answers to questions or paragraphs and essays. Then, each day, you are given a short part of the story that you must edit using things you have learned about. You also have to identify parts of speech using given abbreviations, define challenging words, and, sometimes, select correct homophones. Finally, you copy each week's passages correctly into a book, so, in the end, you will have a grammatically correct story about Robin Hood. The program is meant to be used a little each day, but I chose to do it in shorter or longer sessions a few days a week instead. This way, I could keep up with it, but also not work on it every day. I used the book by myself, then, about once a week, I worked with Mom to go over vocabulary orally so I would not have to write out definitions or synonyms. We also checked my work and sometimes looked over my copywork. One time, when my mom was having a surgery, my grandmother worked on Robin Hood with me instead of my mom. It was easy for her to do so with the Teacher's Manual. Having been working on this for a number of weeks, I think it is one of the best ways I've learned grammar. Other than actually writing a book myself and having my mom edit it with me, it is the only thing I have used so far that is story-based. I have liked learning about grammar in context, learning little by little, building on things and reviewing them. I would highly recommend this book, and my recommendation is pretty huge, because I usually hate grammar things (besides writing and editing my own book), dislike workbooks and anything I have to handwrite, and don't like set curriculums. But I like this and plan to keep using it! Seriously, my son has had no qualms with continuing to learn with Fix It! Grammar Robin Hood week to week and that speaks volumes! Working with short passages, my son learns applied grammar, one small bit at a time, through a spiral approach that leads to long-term mastery and transfer to personal writing projects. There are no fill-in-the-blank, drill-n-kill exercise and no time-draining assignments. Rather, there is an engaging story to immerse yourself in while puzzling out increasingly challenging corrections and identifications that constantly keep you learning and reviewing grammar, vocabulary, and writing. I am so pleased to have found Fix It! Grammar through this review and already looking forward to using the next book in the series of six Fix It! Grammar books with my son. Skills in each book build on those of the last, so you can begin with book one and head on up the series or you can go to the IEW website to find a placement test which will make it clear if you might be better off starting your child a bit later in the series. Whether starting with Book One, Book Two (like us), or the more challenging Books Five and Six, you are sure to find detailed, but not overwhelming lessons that flow perfectly from one to another providing ease for English Language Arts learning. Bonus - the price is extremely affordable. The Teacher's Manual costs only $19 and includes a link for a printable student e-book. Or, you can pay $15 more for a pre-printed, spiral bound Student Book. If you'd like to learn more about Fix It! 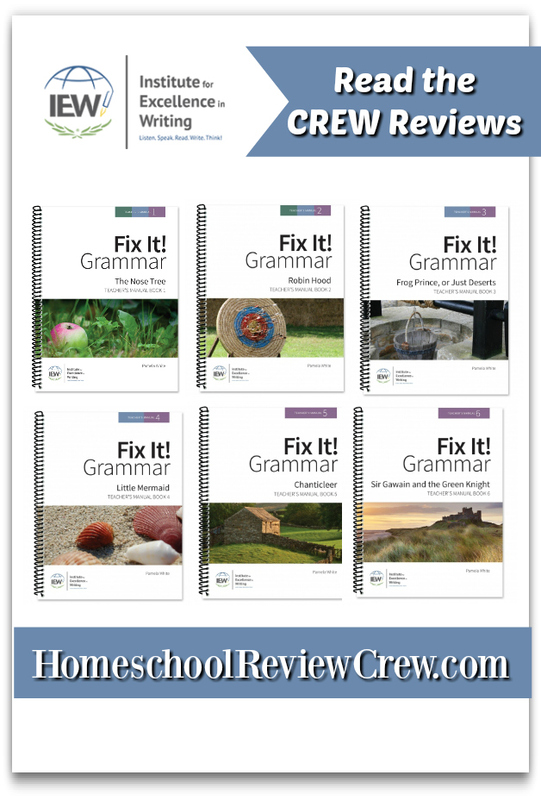 Grammar, click on over to see what 60 Homeschool Review families think about different levels of the program. Click here to visit Simply Natural Health. Go Egging with this FREE Spy Wednesday Printable! Get a FREE New Way of the Cross Nature Hunt Printable to Use This Lent! Lookin for An Older Post? 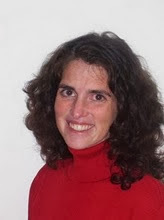 Martianne Stanger/Training Happy Hearts is a participant in the Amazon Services LLC Associates Program, an affiliate advertising program designed to provide a means for sites to earn advertising fees by advertising and linking to Amazon.com.